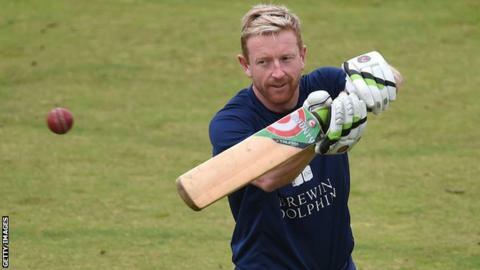 Paul Collingwood has agreed a return to Scotland's coaching staff for next year's World Cup. Scotland booked their place in Australia and New Zealand at the start of the year with the Durham captain as joint interim head coach. The 38-year-old was then England's assistant coach for the World Twenty 20 in Bangladesh in March. "Paul will bring a calmness and confidence to our environment," said Scotland head coach Grant Bradburn. "He is very familiar with all of our players having been a support coach with Scotland during the World Cup qualifiers in February. "Having the experience of Paul in our corner will be a huge asset for all of us during this event." New Zealander Bradburn was appointed in April, with Collingwood and Craig Wright taking up temporary roles for the ICC qualifying tournament after Pete Steindl stood down last December. Collingwood, England's most capped one-day player and World T20 winning captain who still playing county cricket for Durham, worked briefly under Ashley Giles for England but his role was discontinued when Peter Moores returned as head coach. Now he will bid to upset England when they meet the Saltires in Christchurch on 23 February. Scotland also face Australia, Sri Lanka, Bangladesh, New Zealand and Afghanistan at the World Cup. "It's a great pleasure for me to be back on the coaching team with the Scotland squad," said Collingwood. "I'm very much looking forward to working with them to help get the team fully prepared for these incredibly important matches."